﻿ Improvement of the productivity by the gas injection. Accuracy improvement of mass-produced products of plastic・weight saving・reduce the cost and gas injection (hollow molded). Method of molding to get rid of the middle (hollow) at the inside of the product. By filling up with gas to the inside of resin which was injected to the mold, the inner part of the product will be hollowed. Furthermore, the external appearance will not be changed. Because of the hollowization of product, the shrinkage will be decreased, and as a result, the stability of dimension can be achieved. Emergence of the dent, warpage and torsion will be declined!! Availability of simplification for the process of molding by the gas charge. 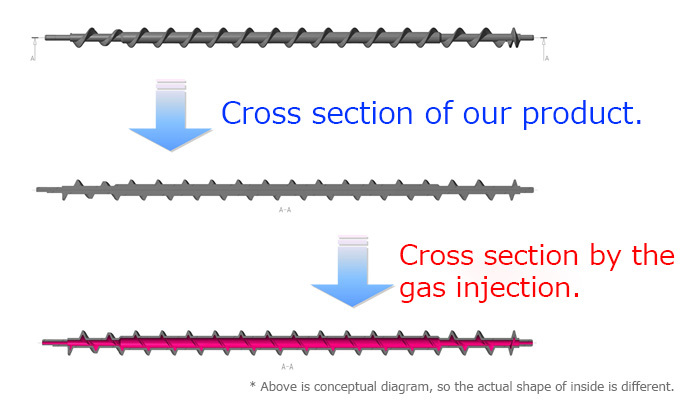 ■Molding process by the gas injection. 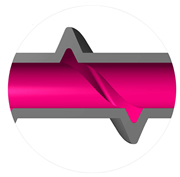 Availability of the reduction of cycle time, because the whole process of press fitting the resin was omitted. Availability of the curtailment of cost by reducing the total amount of resin. Because the inside of our product was pulled out, the necessity amount of resin will be decreased. "Where will be the most effective part for the gas to be injected?" "Is there any gas path?" The detail discussion will be necessary. We have enough experience in terms of the production by the gas injection, so based on the past achievements, we can surely produce the precise and high quality products.